Whether you’re in the middle of a kitchen renovation, just starting to make plans or are looking to make a quick appliance upgrade, check out our Kitchen Renovations 101 e-book for everything you need to know to make your project a success. Often created with a protective, black-tinted polymer finish, black stainless steel appliances are a smart investment in three key ways. Property managers often make quick upgrades to properties by installing stainless steel appliances. They’re easy to install and can hold up to extended wear and tear. The same is true of black stainless steel – it’ll stand up to regular use, year after year. If you do get a little scratch from standard wear and tear, a little sandpaper, sealant and elbow grease can remedy any accidental scratches in a jif. They say you shouldn’t judge a book by its cover, but many potential renters do. That’s why it is essential to keep properties looking great. Black stainless steel has endless visual appeal. It’s sleek. It’s modern. It’s new and different. Upgrading kitchen appliances with black stainless steel creates a high-end look that residents will love – even if it leads to rent increases. Moreover, these upgraded appliances increase a property’s appeal, outshining the competition every time. What renters love most about black stainless steel appliances is the simple maintenance. While traditional stainless steel can attract fingerprints like a moth to a flame, the finish on black stainless steel appliances is smudge-proof and easy to clean. It doesn’t require any specialty wipes; a clean, damp washcloth will do. 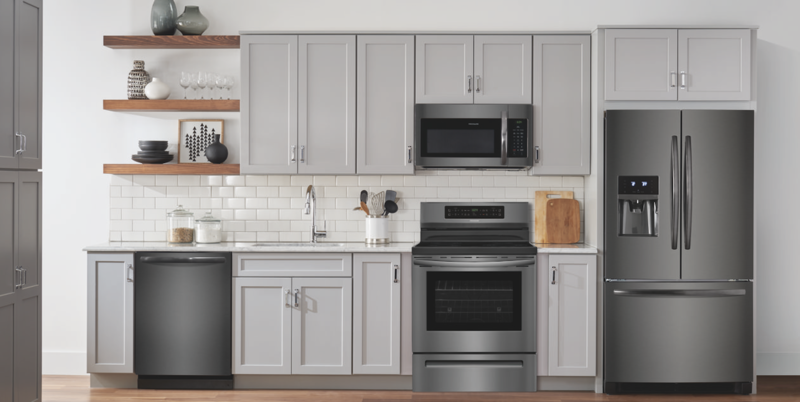 At FJS Distributors, we’re proud to carry Frigidaire’s line of traditional and black stainless steel kitchen appliances. They’re easy to install. Easy to match to any kitchen décor. Easy to maintain. Easy on the eyes. Did we mention that upgrading your properties with black stainless steel kitchen appliances is easy?